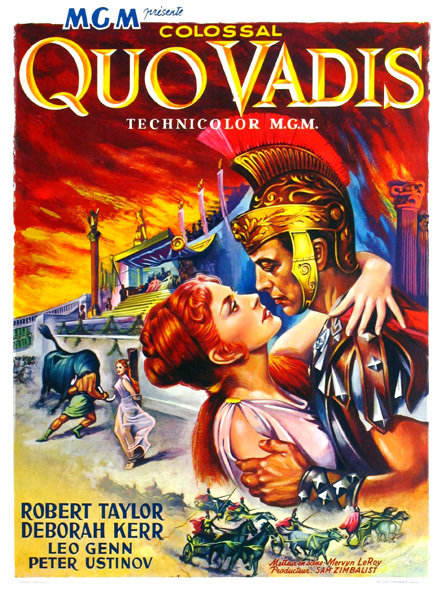 (1951) The action takes place in ancient Rome from AD 64–68, a period after Emperor Claudius' illustrious and powerful reign, during which the new corrupt and destructive Emperor Nero ascends to power and eventually threatens to destroy Rome's previous peaceful order. The main subject is the conflict between Christianity and the corruption of the Roman Empire, especially in the last period of the Julio-Claudian line. The characters and events depicted are a mixture of actual historical figures and situations and fictionalized ones. The film tells the story of a Roman military commander, Marcus Vinicius, who is also the legate of the XIV Gemina, returning from the wars, who falls in love with a devo... read more...ut Christian, Lygia, and slowly becomes intrigued by her religion. Their love story is told against the broader historical background of early Christianity and its persecution by Nero. Though she grew up Roman as the adopted daughter of a retired general, Aulus Plautius, Lygia is technically a hostage of Rome. Marcus persuades Nero to give her to him for services rendered. Lygia resents this, but still falls in love with Marcus. Meanwhile, Nero's atrocities become increasingly more outrageous and his acts more insane. When he burns Rome and blames the Christians, Marcus goes off to save Lygia and her family. Nero captures them and all the Christians, and condemns them to be killed in the arena. However, Marcus's uncle, Petronius, Nero's most trusted advisor, warns that the Christians will be made martyrs and, tired of Nero's insanity and suspecting that he might become a victim of his antics too, commits suicide by slitting his wrist artery, sending Nero a farewell letter in which he finally communicates his derisive opinions he had never been able to tell the emperor in fear of his own life. Marcus is arrested for trying to save Lygia. In prison, Saint Peter, who has also been arrested after returning to Rome upon a sign of the Lord, marries the couple; eventually, he is crucified upside-down as an ironic twist at the whim of Nero's guard. Poppaea, Nero's wife, who lusts after Marcus, devises a diabolical revenge for his rejection of her. Lygia is tied to a wooden stake in the arena. A wild bull is also placed there, and Lygia's bodyguard giant, Ursus must try to kill it with his bare hands, otherwise Lygia will be gored to death. Marcus is tied to the spectator's box and forced to watch, much to the horror of his officers, who also attend the spectacle. When all seems hopeless, Ursus is able to break the bull's neck. Hugely impressed by Ursus's courage, the crowd exhorts Nero to spare them, which the emperor is not willing to do. However, Nero's four other retainers Seneca, architect Phaon, Lucan, and Terpnos vouch for the mob's demands by putting their thumbs up as well. Marcus then breaks free of his bonds, leaps into the arena, frees Lygia with the help of his loyal troops from his legion, and announces that General Galba is at that moment marching on Rome, intent on replacing Nero. The crowd, now firmly believing that Nero, and not the Christians, is responsible for the burning of Rome, revolts. Nero flees to his palace, where he strangles Poppaea to death, blaming her for attempting to scapegoat the Christians. Then Acte, a palace slave who was once in unrequited love with Nero, appears and offers to aid him in ending his own life before the mob storms the palace. The cowardly Nero cannot bring himself to do it, so Acte drives the dagger into his chest, weeping over his demise. Marcus, Lygia and Ursus are now free and leave Rome. By the roadside, Peter's crook, which he had left behind when he returned to Rome, has miraculously sprouted flowers. The radiant light intones, "I am the way, the truth, and the life."